Narendra Modi at Madison Square Garden: Why 19,000 people cheered for the Indian prime minister in NYC. Why the controversial Indian prime minister drew 19,000 cheering fans to Madison Square Garden. India’s Prime Minister Narendra Modi waves as he arrives to speak at Madison Square Garden in New York on Sept. 28, 2014. Theroux was, of course, conveying that Naipaul could be a lunatic and a hothead—shelling Mombasa was a ludicrous idea. But this exchange tells us more than that. 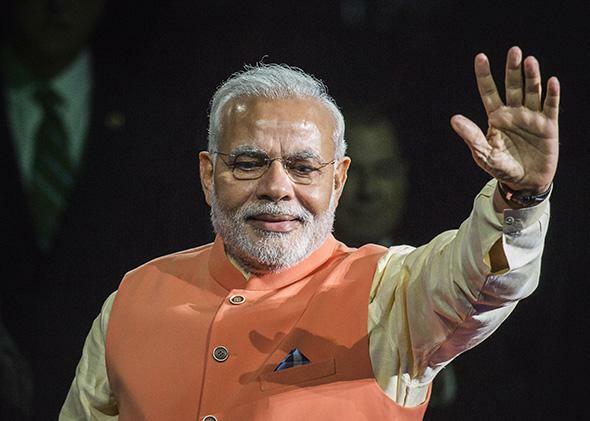 For one thing, it explains why Narendra Modi, India’s newly minted prime minister, has emerged as one of the world’s most popular and most polarizing political figures. Naipaul, a British writer born in Trinidad, is a descendant of Indian laborers who settled in the Caribbean in the 1890s. Like many members of the Indian diaspora, he has a love-hate relationship with India itself. During his first visit to India in the 1960s, Naipaul was appalled by the poverty, lassitude, and decay he found almost everywhere. Yet in later years he came to celebrate the nationalist self-assertion of India’s Hindu right, which he saw as a potential source of the country’s renewal. These were the kind of Indians who loved their country unreservedly, and Naipaul admired them for it. Modi strikes many observers as one of these Indians, too. And that, I’d submit, is why he attracted 19,000 cheering fans to a rally in Madison Square Garden on Sunday. Many of Modi’s most loyal followers are indeed Indians and people of Indian origin living outside of India. This might strike you as contradictory: If these Modiphiles are such devoted Indian nationalists, why would they leave their native country to become cardiologists in Houston or financial engineers in Singapore? The reason is that until very recently, India has offered scant opportunities for its best and brightest. Many Indian émigrés are of the view that the best thing they can do for their country is to make something of themselves abroad, and to then spread their wealth and influence back home. By promising to make India a country they can be proud of, and a place where bright young Indians can make their fortunes, Modi tells these reluctant exiles exactly what they want to hear. In the wider world, India is best known as the home of Gandhi, the patron saint of passive resistance, and Nehru, the socialist aristocrat who served as the country’s first prime minister and who insisted that the world’s most populous democracy remain nonaligned. Within India, however, there have always been those who’ve opposed Gandhian pacifism and Nehruvian socialism. India’s humiliating military defeat at the hands of China in 1962 was an early indication to these dissenters that calling for peace and love wasn’t the best way to win respect on the international stage. East Asia’s rapid economic rise in the decades that followed, meanwhile, proved to them that India’s embrace of Soviet-style central planning was a colossal mistake. India’s pro-market nationalists have always been a small minority, particularly among the country’s intellectuals. But their ranks have grown over the past two decades, for a number of reasons. First, India was forced to open its economy in 1991 in the wake of a balance of payments crisis. The reforms that followed sparked sustained economic growth that in turn led to rising expectations, particularly among members of India’s growing urban middle class. But India’s economic growth has come disproportionately in high-tech services, a sector that draws on a pitifully small and relatively privileged swath of India’s population of 1.25 billion. The political coalition for economic reform thus wound up far smaller than it might have had its benefits spread more widely, as in the fast-growing East Asian economies. Nevertheless, this experience convinced at least some Indians that what the nation really needed was to deepen economic reform, not to abandon it. Second, the decline of Nehru’s Congress Party coincided with the rise of dozens of communal and caste-based political parties that reflected India’s diversity and its disputatiousness. This political fragmentation led at least some Indians to look to Modi’s Bharatiya Janata Party as a unifying, truly national alternative to the badly discredited Congress Party. The BJP has traditionally been dominated by parochial Hindu chauvinists hailing from India’s Hindi-speaking heartland. But under Modi, the party shows signs of becoming something quite different. Modi, hailing from Gujarat, one of India’s more prosperous states and the native region of many of India’s most successful émigrés, represented a different, more modern strain of the party. Though often accused of Hindu chauvinism (and worse) himself, Modi was resented by the BJP’s old guard, who saw him as an ambitious outsider who sought to displace them. They were right. As chief minister of Gujarat, the local equivalent of a state governor, Modi embraced cutting-edge campaign techniques, including social media, to make the case for a leaner, corruption-free government. His slogan was “minimum government and maximum governance,” a neat way of telling Indians that he wanted to make the country less oppressively bureaucratic while also making it richer and more orderly. Of course, not everyone buys into the Modi magic. The prime minister is widely loathed among Indian intellectuals. Pankaj Misra, the go-to Indian voice for highbrow periodicals in the English-speaking world, lambastes him as a “dangerous cliché” who panders to Indian insecurities. So is Modi a Muslim-hating zealot? One thing we know for certain is that his rhetoric has grown more inclusive over time. Ashutosh Varshney, a Brown University political scientist and a leading expert on communal violence in urban India, observed earlier this year that in his campaign speeches, Modi had abandoned the more chauvinistic aspects of Hindu nationalist ideology, including anti-Muslim sentiment. He is a nationalist like Naipaul, but you’d be hard-pressed to find evidence that he is a lunatic and a hothead. When Modi campaigned for the BJP in India’s general election this spring, his bread-and-butter, growth-centric message resonated. With 31 percent of the vote, the BJP managed to secure the first single-party majority in 25 years, which gives Modi unprecedented autonomy. While 31 percent of the vote might not sound very impressive, the Congress Party, now India’s second-largest, won only 19 percent, with various lesser parties splitting the rest. The consensus view is that the BJP’s strong showing was less a vote for the BJP than it was a vote for Modi, and his vague but oft-repeated promise of a brighter economic future for India. So how exactly does Modi intend to rev up India’s growth engine? According to Sanjeev Sanyal, Deutsche Bank’s global strategist and a leading light of India’s pro-market right, Modi intends to mimic East Asia’s strategy of relying on labor-intensive, export-oriented manufacturing. China grew rich not by becoming a hub for high-tech services but by becoming the workshop of the world. Now, however, China is aging rapidly, and wages for its workers are rising rapidly as well. India, with its large, growing, youthful population, is an increasingly attractive alternative for multinationals looking for a manufacturing hub. This manufacturing-first strategy, long championed by pro-market Indian economists like Arvind Panagariya and Jagdish Bhagwati, will entail a more rapid migration of poor Indians from small villages to large cities, and a huge productivity boost as they go from growing food to making things in enormous factories. While educated Indians have benefited from the first wave of reform, this potential second wave would have a more direct positive impact on the poorest of India’s poor. There are no guarantees that Modi’s strategy will work. To become a manufacturing powerhouse, India will have to reform its ridiculously stringent labor laws, which are very much the third rail of Indian politics, and spend vast sums of money on roads and power plants and all of the other basics of industrialization. This will be an issue, as the Indian bureaucracy is famously terrible at spending money wisely.